Dorothy E. Siminovitch, PhD, MCC, a Master Certified Coach, is founder and principal of Gestalt Coaching Works, LLC and an international coach, consultant, group facilitator, presenter/speaker, and author. She is founder, co-owner, faculty, and Director of Training for the Gestalt Coaching Program in Istanbul and the Gestalt Coaching Program in Toronto, both ICF-ACTP coach training programs. She is also co‐founder of the Gestalt Center for Coaching, which delivers ICF-accredited coach training workshops and extended programs internationally. Dorothy is a graduate of Case Western Reserve University’s prestigious Department of Organizational Behavior. She envisioned the application of Gestalt theory in the service of coaching in 1995, and has been delivering Gestalt coach training since 1996. The Gestalt Coaching Program in Istanbul was her second Gestalt‐based coach training program to garner ICF-ACTP certification. Her third ICF-ACTP coach training program, the Gestalt Coaching Program in Toronto, launches in 2017. Dorothy honed her rich teaching, coaching, and consulting skills while serving in leadership and teaching roles at the Gestalt Institute of Cleveland and through her affiliation with other Gestalt centers and coaching thought-leaders. She provides world‐class training in and transformative human development through Gestalt-based coaching and holistic approaches, leading to outstanding results for individuals, groups, and organizations. Her specialties are coaching for signature presence, leadership presence and peak performance, overcoming derailment, and working with high performance groups and teams. She presents additional training and development opportunities at the International Coach Federation conferences and by invitation worldwide. She is evolving an integrative Gestalt-based practice though the Awareness IQ™ project. Dorothy is a master — elegant, simple, provocative, deep and fully present to the moment and the opportunities at hand. Our leadership team gathers for a retreat and new learning each winter and last year we spent two magical days with Dorothy. Each leader on the team spends so much time teaching, coaching and consulting with individuals, teams, and larger scale organizations -- the power of our presence in the months to come was profoundly impacted through our work with Dorothy — what a gift to any leader! 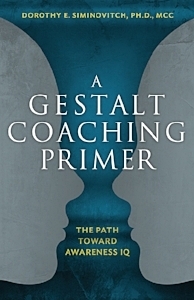 Dorothy demonstrates the range, relevance, and power of Gestalt core concepts, models, and practices for coaches, consultants and leaders facing the challenges of today's complex, ever-shifting environments. The elusive but essential concepts of awareness, presence, and strategic use of self are clearly explained and illustrated, supporting readers on a journey to personal and professional mastery. All coaches, whether experienced or novice, will find a wealth of knowledge and wisdom to draw from. Available from Amazon. To provide excellent and transformative Gestalt-based coaching and consulting services to individuals, teams and organizations. To provide world-class training in and human development through Gestalt-based coaching and group leadership. To create a cross-cultural and broad-based forum for conversation with outstanding leaders in coaching, consulting, and Gestalt theory development. Gestalt Coaching Works and the Gestalt Center for Coaching reserve the right to change program details as necessary. If a course is cancelled or dates are changed, neither Gestalt Coaching Works nor the Gestalt Center for Coaching assume responsibility for non-refundable airline tickets, travel, lodging, or other expenses incurred. We highly recommend trip cancellation insurance and receiving program confirmation before purchasing non-refundable travel tickets. Send your cancellation notice via email to Martha Lannoch, Administrator, at info@dorothysiminovitch.com. · If you cancel up to 30 days before the start date, you will be refunded your course tuition less a processing fee of $75usd. · If you cancel between 29 and 14 days before the start date, you will be refunded 50% of your course tuition. · Cancellation 13 days or fewer before the start date receives no refund. If Gestalt Coaching Works or the Gestalt Center for Coaching cancels a program, we will provide as much advance notice as possible, and a full tuition refund will be given.